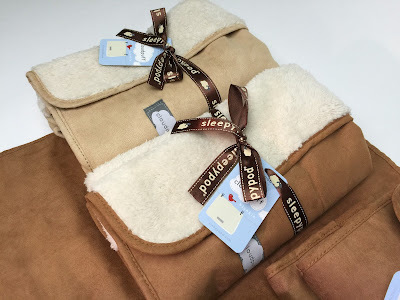 Sleepypod "Cloudpuff Blankie": Review And Giveaway! 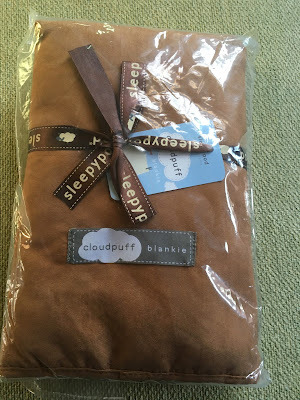 Here's the Cloudpuff Blankie we received. See how you can enter to win one of these gorgeous Blankies at the end of this post! Note: We received one "Blankie" for our review and use. Then...we received another one from the company due to a shipping error. We're keeping one and have given away the extra to our friend who just became a pet parent for the first time. Sleepypod will kindly ship one Sleepypod Cloudpuff Blankie in the winner's choice of size and color. Of course, the opinions in this post have not been swayed by receiving these samples...really! We are thrilled, thrilled we tell you, to share with you a bit about Sleepypod's Cloudpuff Blankie—it's classy, great looking and extremely well made—in other words, what you've come to expect from Sleepypod. 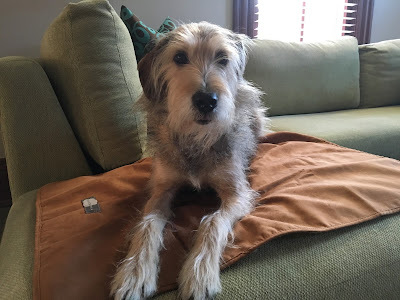 As you might remember, we brought you a review and giveaway of Sleepypod's Clickit Sport dog safety harness earlier this year.—we still love it! Parental Unit was immediately attracted to the Cloudpuff Blankie's rugged, western-ish good looks juxtaposed with its plush super softness: it's made with ultra soft polyester shearling on one side and microfiber suede on the other—it is indeed a "blankie"! And she loves the Champagne or Chestnut color choices. We received the size large in Chestnut. Here I am relaxing on the microfiber suede side. And Ms. Bella resting on the shearling side, which she seems to prefer. 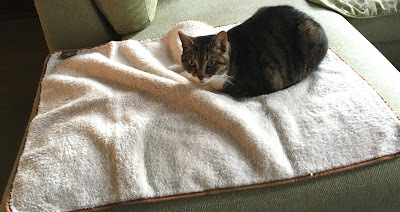 This Blankie is just the right size—not too big to be cumbersome and not too small for either of us to stretch out on. And it has as many uses as you can think of, like a blanket, car seat, sofa or chair cover, or even a pet carrier liner. Of course, the Blankie is machine washable/line dry. Parental Unit has not washed ours yet, but will likely use the cold or warm water delicate cycle. (Don't tell anyone, but she might risk give it a quick tumble in the dryer on very low heat until it is just damp). By the way, in case you're not the lucky winner, you can easily purchase your own Sleepypod Cloudpuff Blankie right here—don't you think they'd make a wonderful (maybe a few days belated) holiday gift for your pet-loving friends? Enter to win by completing the Rafflecopter entries below. Giveaway open to residents of the continental United States, 18 and over and void where prohibited by law. Anonymous or "unknown" comments and entries will not be accepted. This would be so great for my senior dog Mike, he like to lay on the floor near me, not in his many beds (I don't know why), but then he is cold. What a beautiful blankie and we love the color choices! I would love to win the leepypod Cloudpuff Blankie for my dogs. They love to be covered up. We'd love to win! If we do, we'll donate it to our local shelter for the pups to use while they wait for their forever homes! I would love to win this for my " little lounge puppy"
Great giveaway, my dog would love this! My pup would be so happy with this blankie. would like to win, thank you! 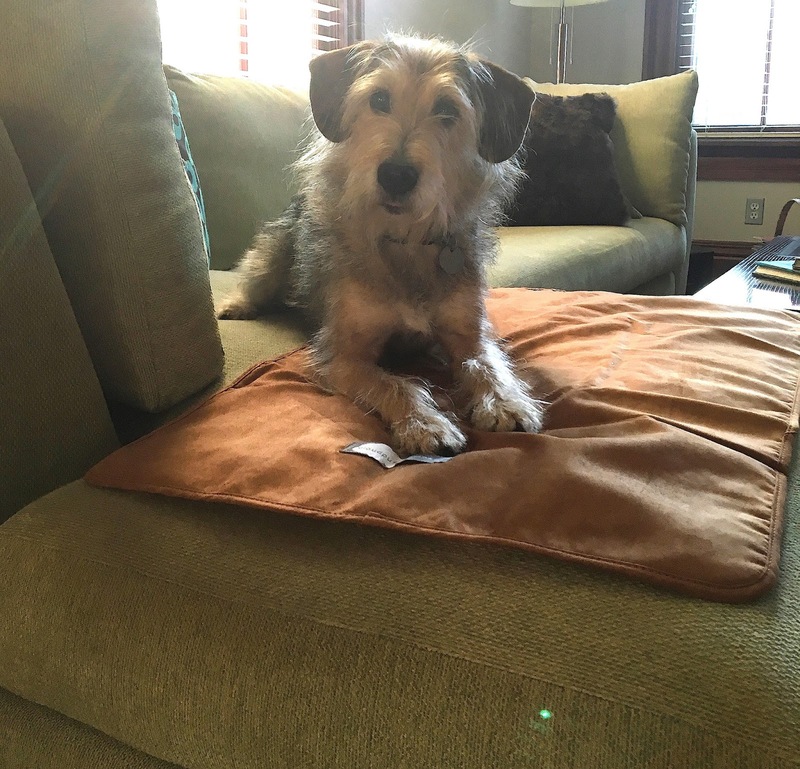 would love to win this for my dog, thanks! ooo!! We would love to win! Our dogs Love blankets!! I'd love to win this for my doggy and kitty! would like to win this for my dog! Would love to win this for my senior crew! I would love to win this. I'm always on the lookout for a good blanket for my dogs. Thanks! My Cat Husani Would LOVE this! I'd love to win for my dog Blackie. He would sleep on it every night. Thanks for sharing. My cat Charlie would so live this! This would be great for my dog. He's such a good boy. Our 2 doggies love blankets! They like to get tucked in at night and snuggle up. I have 4 dogs! Two small, one, medium, and one large. These doggie blankets look fantastic. I would so love to win this for my furbaby Elle Mae. She would just love this. She is a Mini Pin, and loves laying on blankets, she stays kinda cold, so this would be so perfect for her. would like to win this for my pup! I would love to win this blankie for my kittes! They will certainly fight over it! I'd love to win this. I think one of our cats would claim it, though. My dog will love it!! I'd like to win because I think my cat would really enjoy it. I would love to win floor my dog! This would be great for car trips hiding under during storms. I would love to win to give it to my dog as a get well present. he is recovering from an injury. My big 'ol Dane would love this, thanks for the opportunity! This would be perfect for my 11 wk old Pekapoo!!! I would love to win this!! This is perfect for our rescue dog Fonzie! would like to win this for our dog! Melvin would love to win!! !